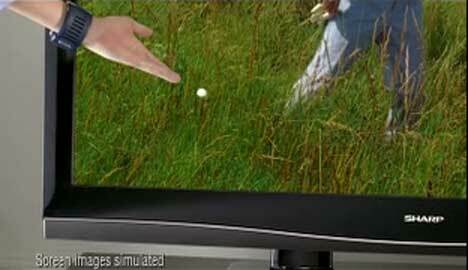 Sharp has launched ‘Lost Ball’, a new TV commercial for the Aquos liquid crystal television screen range. Fergusson is teeing off on the 17th hole of a seaside golf course. As he hits the ball the commentator warns, “Here’s trouble.” A family watch the game from their living room while Fergusson, his caddy and other helpers look for the golf ball in the rough. The boy walks up to the screen and points to the ball, speaking in French, “La boule est là, est là.” In an outside space viewers point to the screen. A Scotsman in a bar mutters to fellow patrons, “He’s looking right at it — it’s there.” Nothing is lost with the full HD 1080p Aquos from the leading innovator of liquid crystal television, Sharp. The Sharp Aquos Lost Ball ad was developed at Wieden + Kennedy, New York, by creative director Kevin Proudfoot and Todd Waterbury, art director Allen Buchanan, copywriter Nick Sonderup, head of production Gary Krieg and agency producer Andrew Loevenguth. Filming was directed by Christian Loubek via Anonymous Content, New York, with director of photography Crille Forsberg. Editor was Avi Oron at Bikini Edit, New York, assisted by Paul San Filippo. Postproduction was done by Flame Artist Eric Gelgand at Nice Shoes, New York, and colorist Tim Masick at Company 3, New York. Music was arranged by Raymond Loewy at Tonefarmer, New York, with executive producer Tiffany Senft. Sound was mixed by Tom Goldblatt at AudioEngine, New York.